So… odd as it sounds, there are very few Modern UI (Metro) packages out there for web applications. I have found one to be full featured from metro-webdesign.info called Metro UI Template. The guy has done a fantastic job and I highly recommend donating and getting the full version. 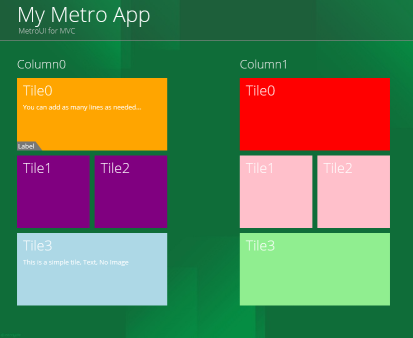 Metro UI Template was written for a PHP, I’m a .NET guy. So we had a problem. So what does a good dev do? Solve the problem. Lets be clear, this is not fully fleshed out and was used to prove some concepts. Hopefully others will jump in and help with these wrappers and flesh them out even more. Read the code! Also note that what I’m posting is based on their “lite” version, so you can try it before you upgrade to his full product. But this means it does not have all the available tile types, but enough for you to get a really good feel of creating a tile based web app. Off we go! Mobile (responsive) design is not available in the lite version, Upgrade to the full version and you will get some really nice tile repositioning based on device, all the way down to mobile phones. For the record, I have no association with metro-webdesign. I found their product to be superior and created a solution for my needs and wanted to share with others how to integrate his project with ASP.NET MVC. I’ve worked with Microsoft LightSwitch since its early beta days. Its exciting to see all the new changes coming with the new Visual Studio LightSwitch 2013. One of the interesting areas is being able to use LightSwitch for your backend and mobile development and other technologies in the Microsoft stack for the desktop. In this first post I’ll show you how we have been successful in adding the MVC framework to a LightSwitch project. You’ll be able use the RAD tools of LightSwitch to develop your database, business logic and mobile screens. And then use the full power of ASP.NET MVC to do your full web based desktop application, including the new rage of SPA’s. We’ve been successful in using this process for a large application using LightSwitch, ASP.NET MVC/API, Bootstrap and Kendo UI. An amazing combination and one that I’ll continue to blog about in upcoming posts. Visual Studio 2013 Preview and about 10 minutes is required. The HTMLClient will run first, this can be changed as needed. You’ll get a LightSwitch HTMLClient browse screen that doesn’t show any records, since we don’t have any data. This validates that the LightSwitch side of the app is functioning correctly. Copy the URL, open up a new browser or tab, paste in the URL. Replace the HTMLClient part of the URL with Home. You should get the Hello World page being server up by the MVC framework. So in less than 10 minutes you’ve successfully turned a LightSwitch 2013 project into a platform that has some amazing possibilities. Hopefully the development community will start to take this tool seriously! Stay tuned for upcoming posts of our integration with Web API, Bootstrap and Kendo UI.